Get your paws on the stories and secrets of some of history's most heroic hounds! 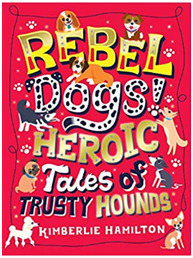 An engaging collection packed with over 30 real-life dogs, including film stars with fur, hounds that love to help, superstars of science and war heroes - these rebel dogs are the stars of their own stories. With incredible fur-raising facts on record-making dogs, marvellous mutts in literature, internet-sensation pups and much, much more - this beautiful book is perfect for pup fans of any age. Rebel Dogs is the perfect gift for any pup lover, all year round!